KEY WEST, Fla. (AP) — A Florida woman received a 10-year sentence for killing an off-duty police officer and injuring another in a drunken driving accident. KEY WEST, Fla. (AP) — A Maryland man accused of abusing a pelican has returned to the Florida Keys to face charges. OCEAN CITY, Md. (AP) — A Maryland man seen tackling a federally protected pelican on video has been arrested on animal cruelty charges out of Florida. KEY WEST, Fla. (AP) — A man who flies air ambulances for a Florida sheriff can also honk the 1958 song "Tequila" using a pink-lined conch shell. KEY WEST, Fla. (AP) — Descendants of four former United States presidents are in Key West to speak about their famous forbears during a forum at the Harry S. Truman Little White House, Florida's only presidential museum. The Saturday afternoon presentation features Truman's grandson Clifton Truman Daniel, Gerald Ford's daughter Susan Ford Bales, Dwight Eisenhower's granddaughter Mary Jean Eisenhower and William McKinley's great-great-nephew Jack Massee McKinley. KEY WEST, Fla. (AP) — It might sound like something out of a Jimmy Buffett song, but a woman was arrested for smashing a beer bottle over the head of another woman who she believed had grabbed her boyfriend in a Key West, Florida bar. Monroe County Sheriff's deputies said Friday that 42-year-old Sally Amato became upset when she mistakenly thought the woman had grabbed Amato's boyfriend in the crotch. Amato is faces charges of aggravated battery with a deadly weapon. KEY WEST, Fla. (AP) — City officials in Key West voted to ban sunscreens containing two ingredients that scientists have said are harmful to the coral reef ecosystem. In a 6-1 vote Tuesday, the Key West City Commission banned the sale of sunscreens using oxybenzone and octinoxate beginning on Jan. 1, 2021. Mayor Teri Johnston said it's the commission's "obligation" to protect the reef, which is the only living coral barrier reef in the continental U.S.
KEY WEST, Fla. (AP) — A Chinese student has been sentenced to a year in federal prison after pleading guilty to illegally taking photos of a U.S. military installation in the Florida Keys. A federal judge imposed the sentence Tuesday on 20-year-old Zhao Qianli. Authorities say he took photos in September of sensitive areas of the Key West Naval Air Station after walking around a fence into a well-marked restricted zone. KEY WEST, Fla. (AP) — David Wolkowsky, the entrepreneurial philanthropist who helped restore Key West, and Tennessee Williams, the celebrated playwright who wrote parts of his best-known plays in the island city, were lifelong friends. KEY WEST, Fla. (AP) — Officials in Key West took the initial steps toward banning the sale of sunscreens containing two ingredients that could be harmful to coral reefs. KEY WEST, Fla. (AP) — The United States Coast Guard rescued a 42-year-old man who was experiencing chest pains while on a fishing boat off the Florida Keys. The agency said in an email that they received a call early Tuesday from the 67-foot (20-meter) fishing boat regarding an ill crewmember who was having a difficult time breathing. The Coast Guard sent a boat crew to the scene and brought the man to shore. He was taken to Lower Keys Medical Center for treatment. MARATHON, Fla. (AP) — Wounded military personnel and their supporters have bicycled across the Seven Mile Bridge and sections of the Florida Keys Overseas Highway during the annual Soldier Ride event from Key Largo to Key West. Some 45 individuals are participating in the event, which continues through Sunday. It's organized by the Wounded Warrior Project to raise funds for injured comrades recovering in American military hospitals. KEY WEST, Fla. (AP) — Authorities say a Florida man chewed up part of a car seat in a deputy's cruiser after being arrested for drug possession. Monroe County Sheriff's officials pulled over 37-year-old Melvin Stubbs Thursday night after noticing the window tint on his vehicle was too dark. Stubbs had a warrant for violating probation stemming from cocaine sales. KEY WEST, Fla. (AP) — Noted American and international writers are in the Florida Keys, exploring origins of literary culture, their archetypes and adaptations. The 37th Key West Literary Seminar began Thursday evening with an address by Margaret Atwood, whose novel "The Handmaid's Tale" was adapted into an Emmy Award-winning streaming television series. KEY WEST, Fla. (AP) — New Year's Eve revelers in Key West can choose between six unusual "drops" planned on the eight-square-mile subtropical island. The newest answer to the Times Square ball drop salutes Key West's aviation heritage. A "stewardess" is to perch in a replica aircraft late Monday at First Flight Island Restaurant, site of Pan American Airways' ticket office after it began in 1927. ANNAPOLIS, Md. (AP) — Celtic music and hammered dulcimer master Maggie Sansone was called to her favorite instrument in Key West, Florida, of all places — a curious spot for the instrument often associated with the Mid-Atlantic and Southern Highlands. That was in the early 1980s, and Sansone was already an accomplished musician and intensely curious about new instruments. KEY WEST, Fla. (AP) — A port of call in Key West's famous Mallory Square is unusable for at least three months while it is repaired for damage caused by a cruise ship crash. City officials said this week that the cost of repairs could be as much as a half million dollars. KEY WEST, Fla. (AP) — Authorities say a Florida couple quit their jobs, stole a 40-foot (12-meter) catamaran sailboat and sailed to Cuba for their honeymoon. The Miami Herald reports 46-year-old Aaron Burmeister and 32-year-old Ashley McNeil pleaded guilty Nov. 13 to charges of conspiracy to transport a vessel in foreign commerce. KEY WEST, Fla. (AP) — A Florida man is suing a local sheriff whose deputies detained him on behalf of federal agents who wanted him deported to Jamaica, even though he is a U.S. citizen. Peter Brown filed the federal lawsuit on Monday, accusing the Monroe County Sheriff's Office in the Florida Keys of violating his constitutional rights. Brown wasn't deported after a friend provided the federal Immigration and Customs Enforcement agency with proof of his citizenship. KEY WEST, Fla. (AP) — Two Florida athletes have won the men's and women's overall Olympic divisions at the annual Key West Triathlon. Josh Eaton, 33, of Orlando finished in 1 hour, 58 minutes and 38 seconds Saturday. Jamie Wohl, 39, of Cape Coral posted a time of 2:28:18. The Olympic-distance triathlon included a 1.5-kilometer swim, a 40 kilometer bike ride and 10 kilometer run. MIAMI (AP) — Coast Guard officials have rescued nearly 100 Haitian migrants from a dangerously overloaded freighter. Miami Coast Guard officials said their helicopter crew spotted the overcrowded, 40-foot sail freighter near Cuba on Saturday. Officials deployed a cutter from Key West to rescue the migrants, saying the vessel was not equipped to carry its passengers and was perilously overcrowded. KEY WEST, Fla. (AP) — Powerboat racers John Tomlinson and Salem Al Adidi have piloted Victory 33 to a Superboat Unlimited-class lead on the second race day of the Key West World Championship series. Tomlinson of Miami and Al Adidi of Dubai began Friday's race in second place but took the lead halfway through the 9.75-lap challenge and never relinquished it. Tomlinson has amassed 46 national and world titles in his 32-year career. Driver Rusty Rahm of Olathe, Kansas, and throttleman Jeff Harris of Greenville, North Carolina, took a first-lap lead and maintained it throughout Wednesday's race, outpacing rivals including two Victory Team boats from Dubai. KEY WEST, Fla. (AP) — The citizens of Key West have elected Florida's first openly-lesbian mayor. Teri Johnston was elected mayor of this historically-gay-friendly city in the Florida Keys on Tuesday. The Miami Herald reports that Johnston was nonchalant on Wednesday when told she had made history. KEY WEST, Fla. (AP) — A Florida driver who said God had distracted her when she ran over and killed a woman in 2015 has been sentenced to 32 years in prison. KEY WEST, Fla. (AP) — An ultramarathon runner has finished a nearly 5,400-mile (8,690-kilometer) diagonal, cross-continental run that began in Alaska and ended in Florida. Pete Kostelnick jogged up to a Key West marker designating the continental United States' southernmost point on Monday. KEY WEST, Fla. (AP) — One of the world's most accomplished offshore powerboat racers is hoping to earn two more world titles this week at the Key West World Championships in the Florida Keys. KEY WEST, Fla. (AP) — Authorities say a Florida man was found dead in the water after a search that lasted more than 24 hours. The Monroe County Sheriff's Office says 64-year-old Raymond Fenton Robbins went to sea on his boat Friday morning as usual but did not return. KEY WEST, Fla. (AP) — The Florida Keys' annual "Fantasy Fest" celebrations are winding down after 10 days of revelry. 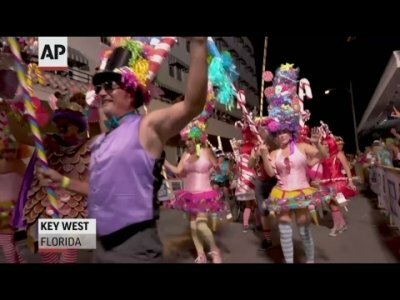 Roughly 60,000 people gathered Saturday night in the island city of Key West for a flamboyant parade. This year's festival theme was "Oh ... The Games We Play!" and many of marching groups in the parade wore costumes inspired by classic board games and casinos. There also was a dragon float inspired by the "Game of Thrones" television series. KEY WEST, Fla. (AP) — It's party time in the Florida Keys during the islands' annual 10-day festival known as Fantasy Fest. The fun kicked off last weekend with a coronation ball for the king and queen and culminates with a weekend parade expected to draw more than 60,000 people. This year's lineup has included almost 100 events, including the Zombie Bike Ride and Friday night's Masquerade March. KEY WEST, Fla. (AP) — An annual population survey in the Florida Keys shows how many people left the island chain after Hurricane Irma last year. The Bureau of Economic and Business Research at the University of Florida found that every Keys city and the unincorporated areas of Monroe County lost residents between 2017 and 2018. The survey found the overall population in the Keys dropped to 73,940 — a loss of nearly 3,000 people. 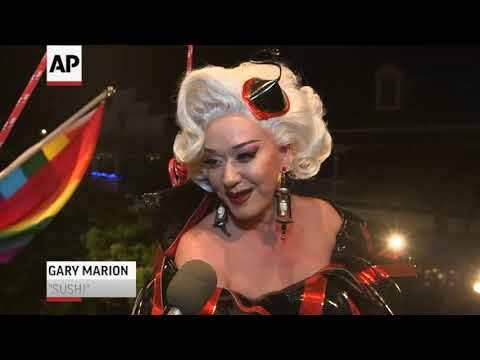 KEY WEST, Fla. (AP) — The Florida Keys' wacky and often-decadent costuming and masking festival is kicking off with a coronation ball to crown the 10-day festival's king and queen. Fantasy Fest begins Friday in Key West. The celebration started in 1979 when a small group of Key Westers were looking to bolster business between summer and winter. KEY WEST, Fla. (AP) — The U.S. government is trying to unload five lighthouses in the Florida Keys. The Coast Guard has declared the lighthouses to be "excess," so the government will try to turn their operation over to a non-profit group or government agency. The Miami Herald reports that if that fails, the General Services Administration will try to sell them at auction. KEY WEST, Fla. (AP) — Officials in the Florida Keys say they euthanized a protected bird that was shot off a ship's mast. KEY WEST, Fla. (AP) — The U.S. Coast Guard has rescued a 62-year-old man whose boat was reported overdue in the Florida Keys. The Coast Guard said in a news release that crews spotted Robert Vonnegut's 10-foot blue and white boat about two miles south of Tavernier in the Florida Keys. His son called the Coast Guard Sunday night to report his father missing when Vonnegut didn't return from a day trip in the boat. KEY WEST, Fla. (AP) — Florida Keys visitors can now have up-close and personal encounters with two exotic pink flamingos. Visitors to the Key West Butterfly & Nature Conservatory had the opportunity Friday to sit on benches in a white gazebo while flamingos Rhett and Scarlett walked free and interacted as they chose. While participants are not allowed to touch them, the flamingos sometimes play with their hair, react to human voices with honks and spread their coral-pink wings. KEY WEST, Fla. (AP) — Police say a protected bird has been shot and wounded in Florida. The Miami Herald reports an unidentified man shot the osprey at Truman Waterfront Park in Monroe County on Tuesday. The bird was seriously injured, having suffered a fractured wing near its rib. KEY WEST, Fla. (AP) — Authorities say a Florida Keys woman is facing felony charges after a confrontation in which shots were fired near boats she wanted to scare off. The Monroe County Sheriff's Office said in a news release that 51-year-old Lelena Sue Moses is charged with aggravated assault with a weapon without intent to kill. She was released on $5,000 bail Saturday. KEY WEST, Fla. (AP) — Authorities say a 49-year-old man has died after being found unresponsive in the water off the Dry Tortugas. Monroe County Sheriff spokesman Adam Linhardt said in an email that Michael Ray Stephens of Panama City, Florida, was airlifted to the Lower Keys Medical Center on Stock Island on Wednesday. KEY WEST, Fla. (AP) — Florida Keys culinary experts are furious about a cookbook author's claim that Key lime pie wasn't invented in the island chain. Pastry chef Stella Parks wrote in her book "BraveTart: Iconic American Desserts" that the Borden milk company invented the recipe in 1931 to market sweetened condensed milk, a prime ingredient in Key lime pie. But Key Westers Tuesday said Key lime pie was a Keys staple before that, citing local newspaper articles from 1926. KEY WEST, Fla. (AP) — Two men have been sentenced for stealing a Key West museum's 17th-century gold bar. During Monday's federal court hearing, Richard Steven Johnson of Rio Linda, California, was sentenced to five years and three months in prison, while accomplice Jarred Alexander Goldman of Palm Beach Gardens, Florida, received three years and four months. They were both convicted of theft this past spring. "Hello? What? God?" Sloan Bashinsky said into his cellphone during Monday night's debate for city commission and mayoral candidates.